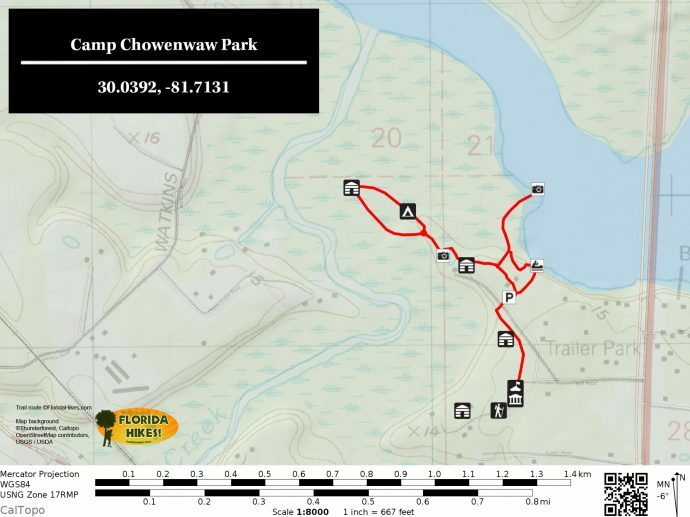 Camp Chowenwaw Park | Florida Hikes! 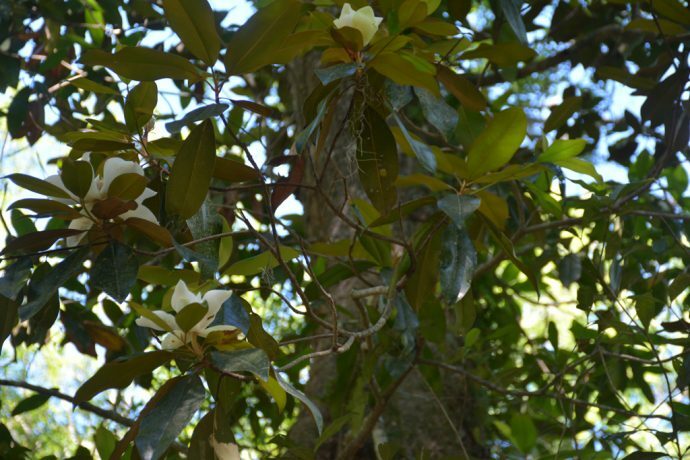 Walking a leaf-strewn trail beneath Southern magnolias taller than any I’ve ever seen before, I realized that the forest I was in had been protected for the last 85 years. 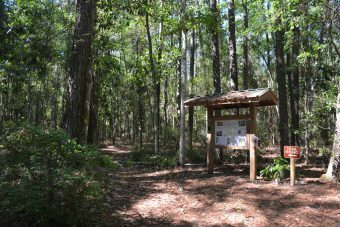 That’s a long time in Florida for the forest to re-establish itself on what was a dairy during World War I and a plantation before that. 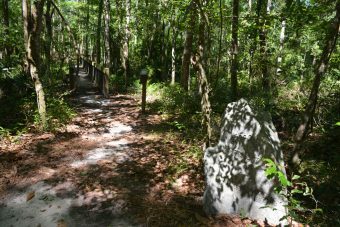 Olustee Monument existed, but the first Florida State Park was yet to open. 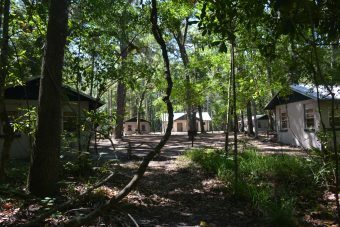 Private camps, not parks, are where citizens went to camp. 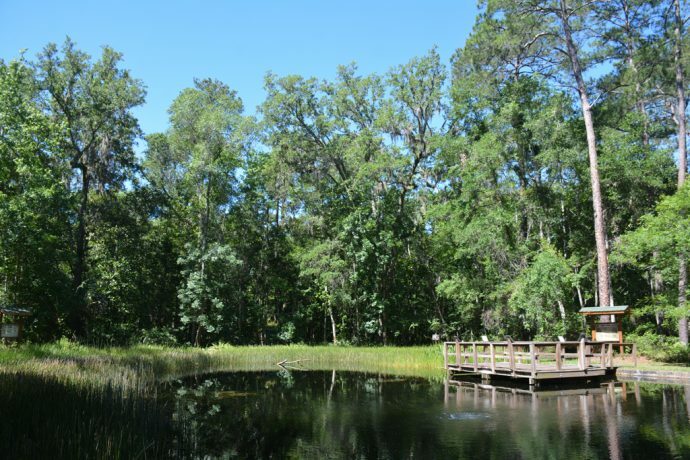 Camp Chowenwaw Park is located off US 17 just south of the bridge over Black Creek leading to Fleming Island. The entrance is on the west side of the highway. 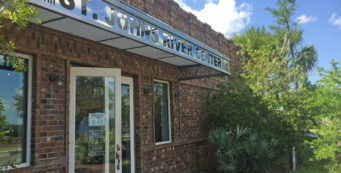 Physical address is 1517 Ball Road, Green Cove Springs, FL 32043. 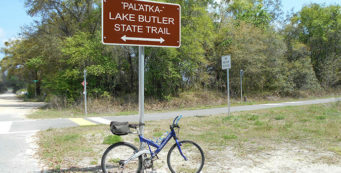 Call 904-529-8058 during park hours for assistance and reservations. 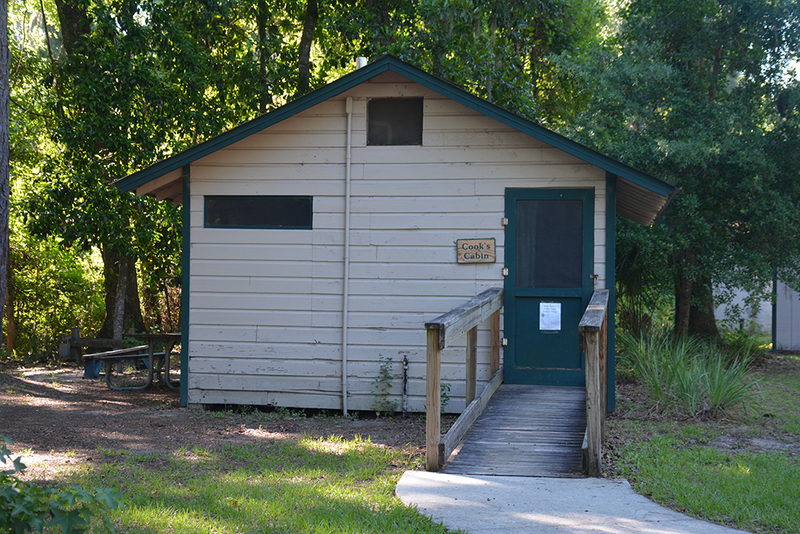 Established in 1932, Camp Chowenwaw – Chowenwaw meaning “sister” in Creek – became Florida’s first Girl Scout camp. To construct facilities during the Great Depression meant bringing in work crews of unemployed men from local communities in a Hoover-era, pre-Civilian Conservation Corps effort, using materials from the property itself. They felled and processed pines for the log cabins, dug clay pits for chinking, whittled pegs to use instead of costly nails, made shingles from cypress trees, and crafted furniture from magnolia wood. 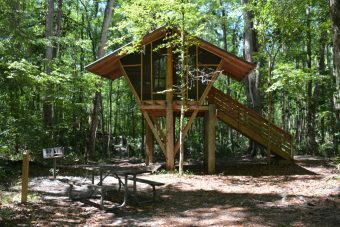 The centerpiece of the camp, Big Cabin, looks out on a cove across to where Black Creek flows into the St. Johns River. In the 1930s, they couldn’t have imagined it being spanned by a highway, but now US 17 adds a buzz of traffic to what was once a serene scene. A cluster of original cabins, including five for visiting troops, a hospital and a bathhouse, and one for the cook and another for the director, centered around Big Cabin. 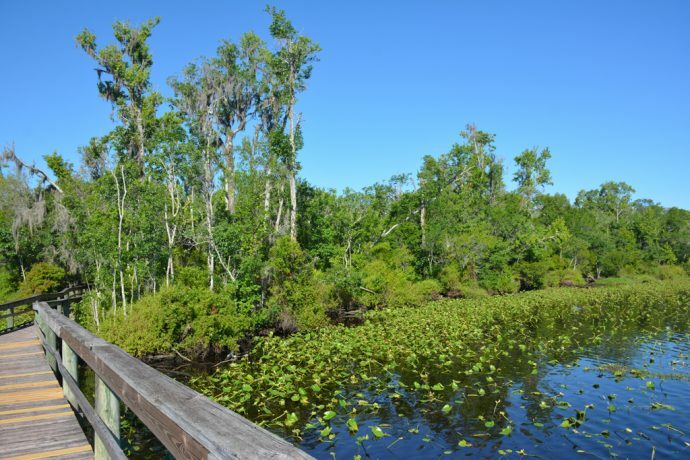 The work crews also created the Jungle Trail – likely the first boardwalk trail in Florida – so the girls could reach a “swimming pen” built in Black Creek which kept water hyacinths and alligators out of their swimming area. 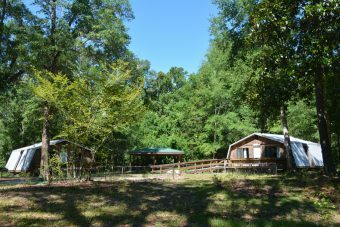 In the 74 years that the camp hosted Scout troops, they continued to add clusters of cabins and camping areas, and eventually replaced the swimming pen, first opening “Otter Springs,” one of the clay pits, for swimming, and then building a real chlorinated swimming pool. Hiking the Hickory Trail, you walk past most of these camping areas, and it’s fun to figure out the vintage of each grouping. 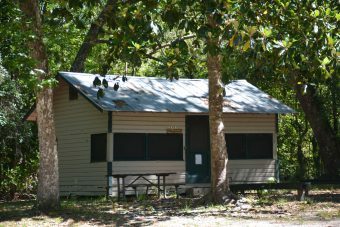 Ahwenussa, for instance, is made up of little log cabins that look like they came from a 1980s KOA, while the concrete block cabins at Squirrel Run have that 1960s feel. 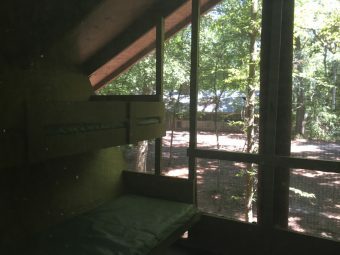 What’s very 1970s – my vintage, had I been a Girl Scout – are the cabins of Treehouse Point. 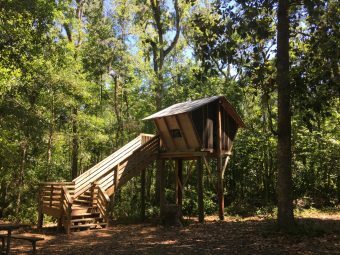 Up on stilts with broad staircases, each treehouse has four bunks and screening on two sides, so you are sleeping in the tree canopy with protection from bugs. Two tenting areas, Magnolia Hill and Hickory Flats, round out the accommodations in the camp. As you might have suspected, the camp is not a Girl Scout Camp anymore. Fortunately, Clay County purchased the camp from the Girl Scouts for $5.8 million in 2006 and opened it as a county park. 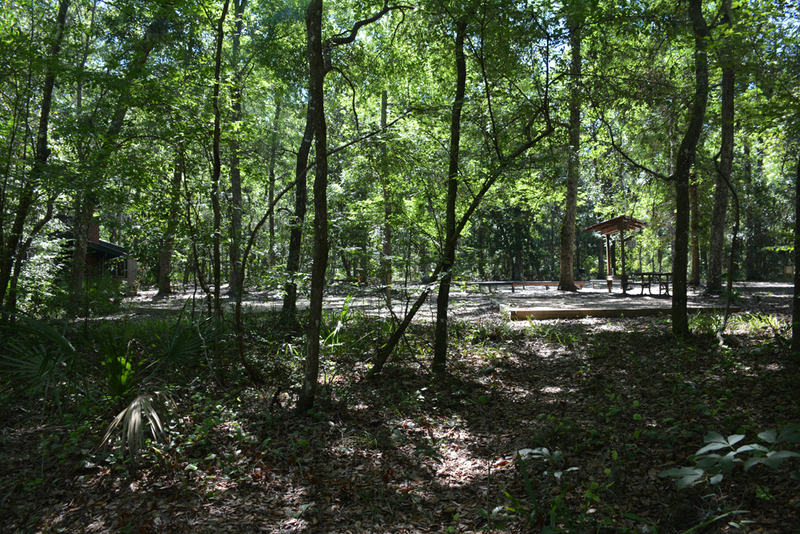 One important aspect of the park is camping, especially for youth groups, given the nice individual camps throughout the 150 forested acres. 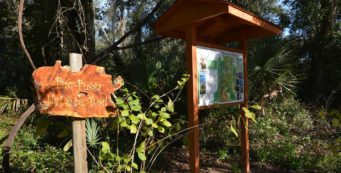 However, individuals and families are welcome to camp here, too, and that’s what makes this park unique in Florida. 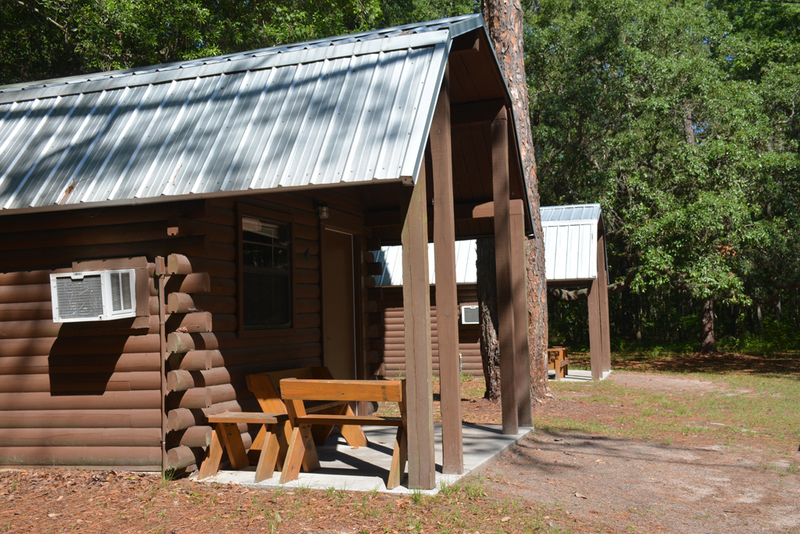 You can rent a single cabin (sleeping 4-16 people) starting at $20, or tent for $15. Or you can rent an entire complex of cabins for a night or two for you and your friends to have a gathering or host a wedding. 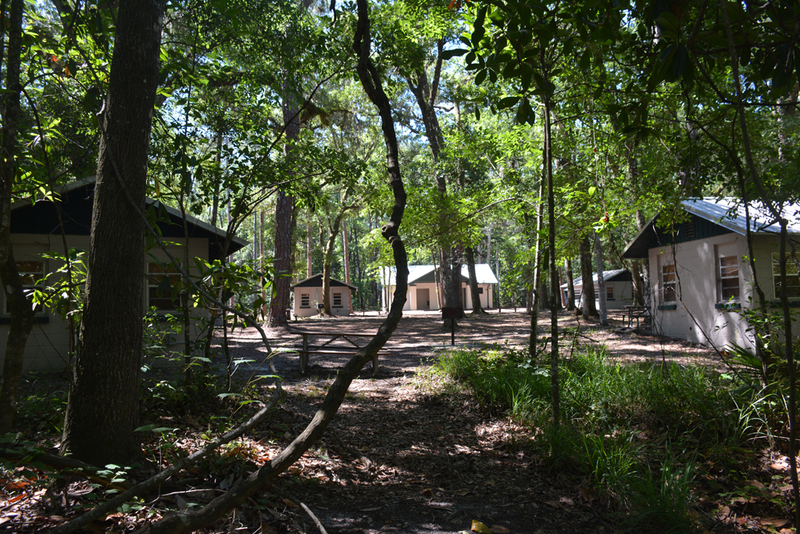 Each complex has a bathhouse and screened dining hall (or kitchen facilities indoors). Only the cabins at Squirrel Run and Ahwenassa have air conditioning. 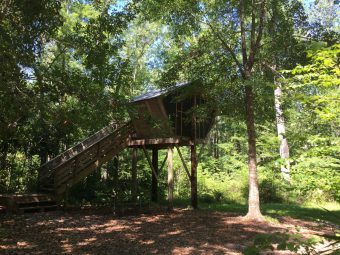 Of course, the Treehouses are a compelling destination for many campers! Day use meeting rooms can be rented as well, including the historic Big Cabin. Nonprofits receive 20% off their camping fees. Camping is in cabins or tents only, no campers or vans, and you must walk to your campsite from the parking area. Carts to pull your gear are available. Along two miles of nature trails, you’ll be as impressed as I was at the sheer size of the trees. There are three different trails to follow. 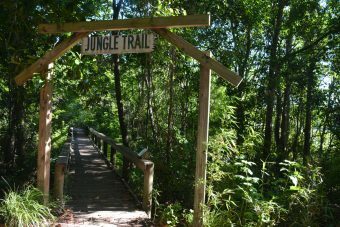 The oldest of the trails, the interpretive and accessible Jungle Trail, starts at Big Cabin and heads out through the swamp along the cove of Black Creek on a long boardwalk to an observation deck on the creek. 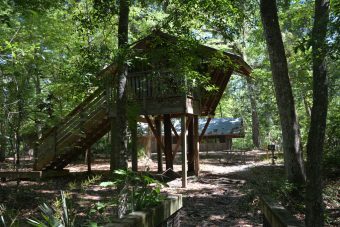 The Treehouse Trail is another beautiful boardwalk, built in the 1970s through the floodplain forest along Peter’s Creek to reach Treehouse Point; it’s primary use is for guests lodging there. Starting from the ranger station, the Hickory Trail loops through upland forests as it passes by most of the camping areas. It’s here you’ll see the towering magnolias and pines that were spared the logger’s axe. 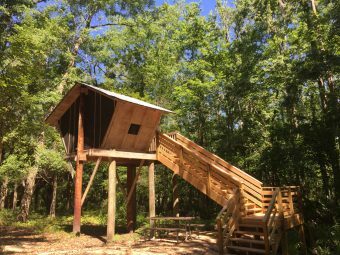 A blue-blazed spur trail off the Hickory Trail leads to a bird blind. Another spur leads to the pool area adjoining Big Cabin. 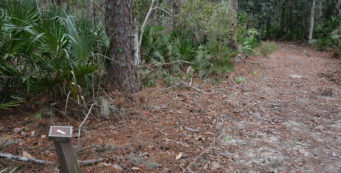 Leashed pets are welcome on the trails, but not in the buildings or overnight camping. 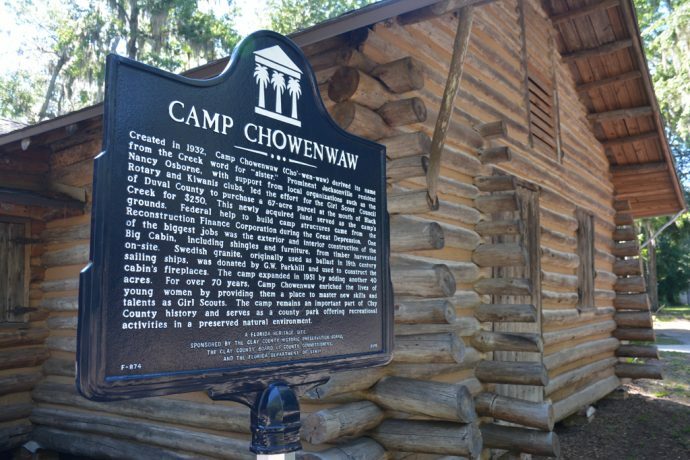 What ties it all together is the Camp Chowenwaw Park History Museum. 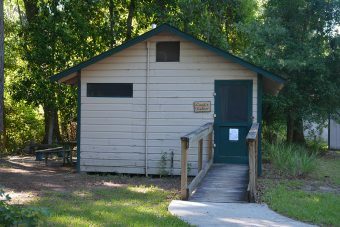 Girl Scout Museums aren’t often open to the public, so this one – housed in a historic cabin – gives a glimpse into not only the history of the park, but the history of Girl Scouts in Florida. Picture 35 young women on horseback, armed with rifles, patrolling the mouth of the St. Johns River and signaling conditions to naval vessels offshore. 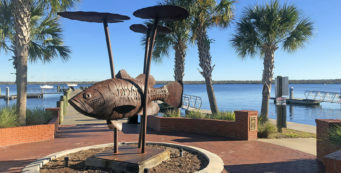 Securing the coast was the primary duty of the first Girl Scout troop in Florida, the Cherokee Rose Troop of Mayport, during World War I. 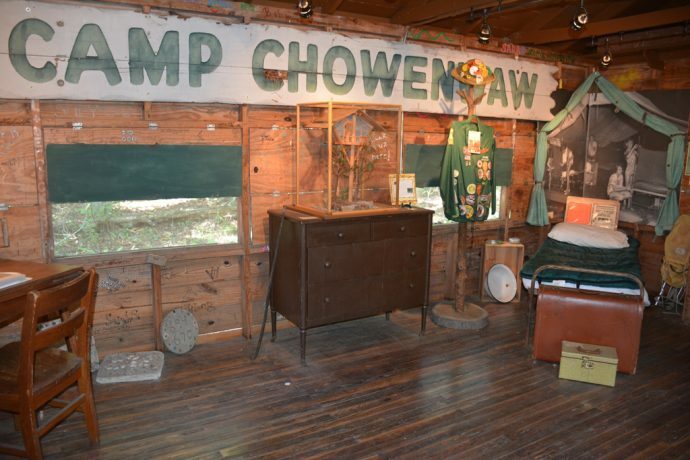 The museum includes many artifacts found on the property and donated by campers who enjoyed their summers here over the years, with a mockup of a cabin bed a centerpiece of the display. The museum opens the third Saturday of each month from 9-11, or by appointment. The park is open 8 to sunset daily, with check-ins for camping between 1-4 at the ranger station. Email or call ahead to make camping reservations, or take your chances on a walk-in on a weekday. 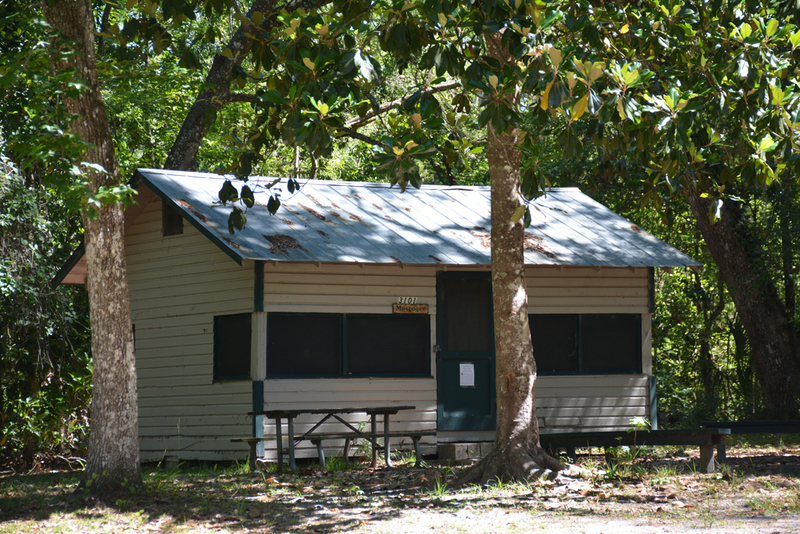 While some of the facilities are as rustic as you’d expect a historic camp to be, the price for staying in the woods near the Jacksonville metro can’t be beat.